NYSC registration online steps on their portal (http://portal.nysc.gov.ng) for orientation camp programme and printing of call-up letter are easy to follow through. Payment for the National Youth Service Corps service to get your call-up number sent to your phone by SMS and to print call-up letter are also included in this guide. We informed you earlier that, starting from NYSC Batch C 2014, prospective corps members will have to register online for the orientation programmes. First, you need to create an account. To do this go to NYSC online registration website at http://portal.nysc.gov.ng/PrePayment.aspx. Fill in the required information in the spaces provided. The following are the data required to be supplied by you. An email containing your details will be sent to you via the email address provided. 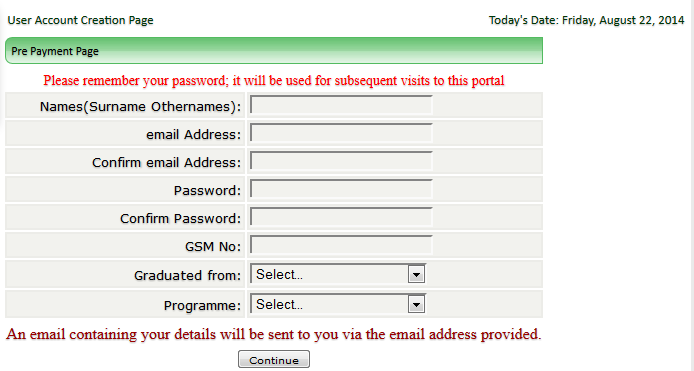 After, this, you will need to proceed to login in order to carry out your NYSC online registration. After your login has been sent to you, start your registration by going to the new NYSC online registration portal for orientation programme. On this page, enter your email address and password in the spaces provided and click on the resume button to continue with your online NYSC registration. To Pay with Interswitch on the National Youth Service Corps online registration page. NYSC Batch C 2014 online registration started on 15th August, 2014. The closing date for registration is 3rd October, 2014. Expy Multimedia is one of NYSC accredited registration centres in Abeokuta, Ogun State. Call 08080085555 for more information.